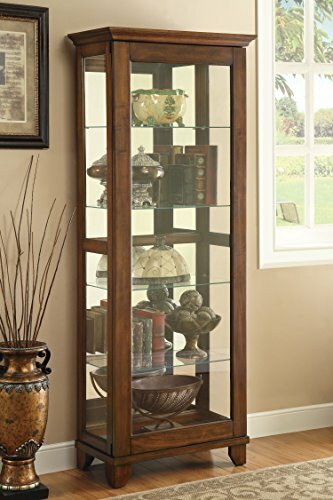 This small tower display case will help you start showing your treasured collectible items. Cleaning glass is much easier than dusting delicate items, so protect your favorite pieces and display them on four glass shelves. Full surrounding glass case means items are fully visible to enjoy their beauty. The tempered glass is strong so no need to worry that casual incidents will create a break through. A sleek black frame creates a simple accent that is stylish and contemporary for your modern home. Easy push-to-open glass doors leave hardware to a minimum. This design is also available in three or five shelves. 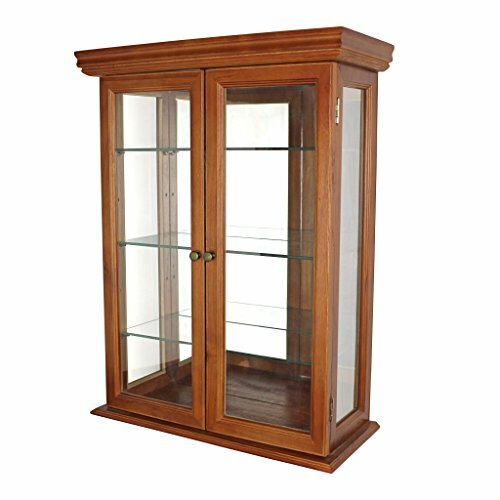 This display case will gives lots of room to store and display your finest small sculptures, vases, and art work. 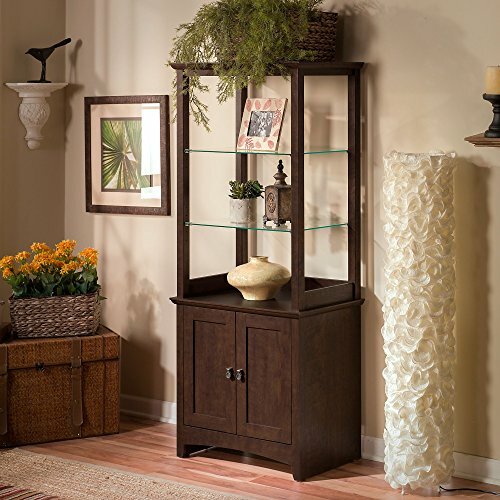 Protect your favorite pieces behind strong tempered glass doors and on five sturdy glass shelves. A sleek black frame creates a simple accent that is stylish and contemporary for your modern home. Easy push-to-open glass doors leave hardware to a minimum. This design is also available in three or four shelves. 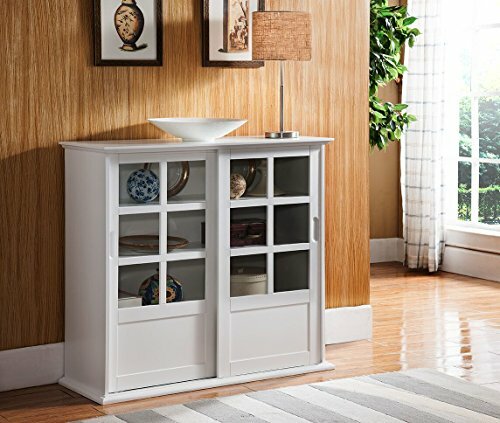 Kings Brand Furniture White Finish Wood Curio Cabinet with Glass Sliding Doors. 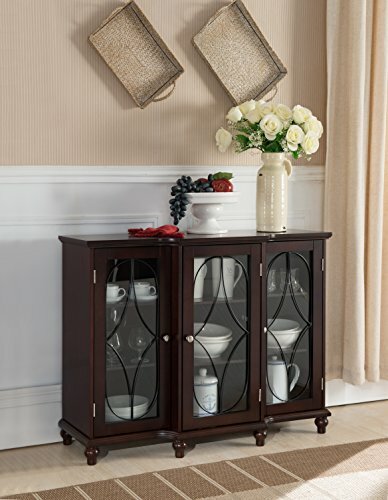 Bring an instant and dramatic update to your home with this versatile curio cabinet. Whether you seek a fancy alternative to the bookshelf or need a place to display your fine china, this cabinet is a tasteful solution. Dimension: 40W" x 15.5"D x 36.25"H.Simple assembly required. Exemplifying everything that makes the country Tuscan style popular, this clean-lined, mirror-backed curio cabinet features three glass shelves and glass side panels to shed maximum light on your prized possessions. 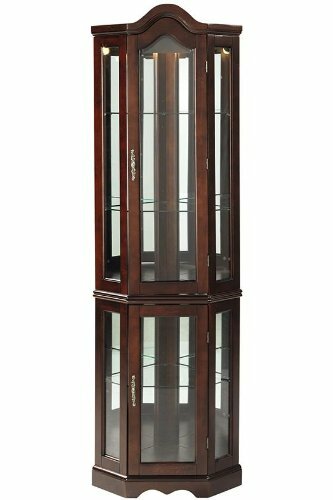 Crafted of solid hardwood, our curio cabinet boasts framed glass doors that open separately for unobstructed viewing from all three sides. With a hand-finished hue to accent any decor, our curio cabinet can be mounted on the wall or set on a console or mantle. This Toscano-exclusive wall curio is perfect for your statues, Faberge eggs, and other favorite collectibles! 20"Wx7½"Dx26"H. 18 lbs. Tired of home offices that offer storage at the expense of your workspace? this two drawer file cabinet provides plenty of out of sight storage without sacrificing an inch of your desk's surface. The cabinet's compact proportions accommodate two spacious drawers and make it a convenient addition to smaller spaces. Or, pair with the coordinating four drawer file cabinet to make the most of home offices of every shape and size. A convenient lock feature keeps sensitive documents safely locked away until you need them, and antiqued brass finish hardware adds just a hint of shine. Hardwood solids and veneers washed in a golden oak finish complete the traditional appeal of this two drawer file cabinet. Tastefully display objects, art or unique works with style and flair. The Bush Furniture Buena Vista Tall Library Storage Cabinet in Madison Cherry holds books, personal items or displays of all kinds. 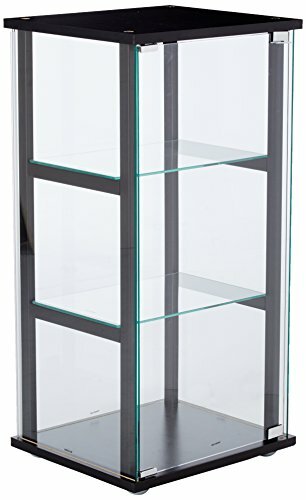 Two attractive, adjustable clear tempered glass shelves fit most room decor. Spacious bottom shelf is adjustable and enclosed by two doors with Aged Bronze metal door hardware. Works at home as a curio cabinet or in an office as a combination bookshelf and storage unit. Small footprint allows room-placement flexibility. Solidly constructed and versatile, the Cabinet features an elegant post-leg design and curved base rails for a splash of panache. Surface and edges resist dings and nicks, scratches and stains. Rugged construction provides long life and offers total functionality. Backed by the Bush Furniture 1 Year Manufacturer's Warranty. See the full collection for coordinating items available. This contemporary desk finished in black with black nickel finished legs has matching bookcases. This is manufactured in Taiwan. Compare prices on Furniture Curio at ShopPlanetUp.com – use promo codes and coupons for best offers and deals. We work hard to get you amazing deals and collect all available offers online and represent it in one place for the customers. Now our visitors can leverage benefits of big brands and heavy discounts available for that day and for famous brands.